Jackpot Capital Casino has changed the way they're giving away bonuses a bit this month. Players are grabbing their compasses and treasure maps as they compete for $130,000 in prize money during the Treasure Trove scoreboard race and this time everyone has a chance to win, not just frequent players that make it to the top of the scoreboard. When you play at Jackpot Capital you automatically earn points and every week top scoring players win bonuses up to $800. Mobile casino players earn double points when they play mobile slots like the pirate-themed Goldbeard. This time, in addition to weekly scoreboard bonuses, Extra Loot bonuses up to $150 will be randomly awarded every Friday – some to top scoreboard players and some to players that haven’t reached the scoreboard yet. The free contest continues until May 19th. 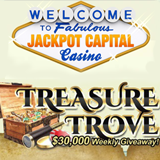 $30,000 in casino bonus prizes will be awarded each week and there will be $12,200 in Extra Loot bonus boosters for a total of $130,000 in casino bonuses. You'll discover hundreds of casino games from Realtime Gaming at Jackpot Capital and you'll be welcome there no matter where you live. Fourteen of their most popular slots are also available in their mobile casino (m.jackpotcapital.eu in a smartphone or tablet browser).